Credit: Esther Kokmeijer/courtesy Hurtigruten AS wegian.com: enter desired port of call and end destination. Voila! Hurtigruten’s Web design teams have done the rest, so travelers can chose a slice of any non-stop tour. All Hurtigruten coastal vessels are in continuous operation, night and day. With its core aim of becoming the world leader in explora- tion travel, this expedition cruise operator would seem to have to shout louder than the formidable marketing machines of the very large cruise ship operators with over 10-times the staff and passenger counts. For Hurtigruten, it’s a strong but niche brand versus the new trend aboard ocean giants to be “? rst at sea” – to entertain in myriad new ways that include virtual parachute descents and indoor snow. Hurtigruten’s aces (apart from glacial descents and real snow) are a recruitment base largely accustomed to working by or on the sea and a pedigree for moving worldly travelers, cargo and locals that arcs back to 1893. Staff, then and now, have had to speak one Scandina- vian language plus English or German. 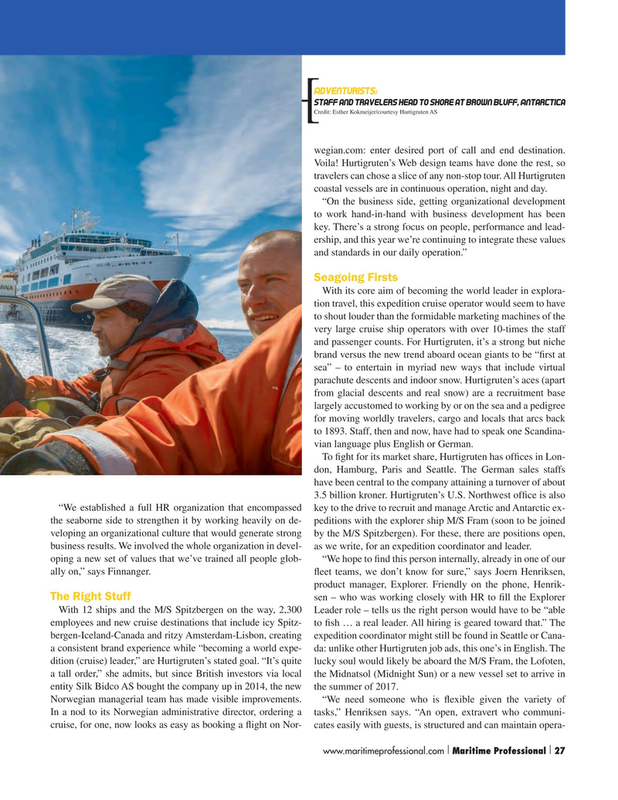 With 12 ships and the M/S Spitzbergen on the way, 2,300 Leader role – tells us the right person would have to be “able employees and new cruise destinations that include icy Spitz- to ? sh … a real leader. All hiring is geared toward that.” The bergen-Iceland-Canada and ritzy Amsterdam-Lisbon, creating expedition coordinator might still be found in Seattle or Cana- a consistent brand experience while “becoming a world expe- da: unlike other Hurtigruten job ads, this one’s in English. The dition (cruise) leader,” are Hurtigruten’s stated goal. “It’s quite lucky soul would likely be aboard the M/S Fram, the Lofoten, a tall order,” she admits, but since British investors via local the Midnatsol (Midnight Sun) or a new vessel set to arrive in entity Silk Bidco AS bought the company up in 2014, the new the summer of 2017.